How much does a typical anime episode or series cost to make? While it's pretty easy to find what is the budget for most anime feature films like those from Studio Ghibli, the average cost for making an anime series, much less an episode, is not readily available. How much does an anime episode or series cost to make these days? Where does the money come from? What is the breakdown of all the cost (to what part [e.g., script, sounds, edition, etc.] go how much of the budget)? This is going to vary a lot depending on the budget of the series. The difference between high budget and low budget series is big enough that applying this to any individual anime is probably not a very good approximation. As an aside, this is essentially a rehash of my answer here, though the question is different enough that I don't think it's a duplicate. for a total of about 11 million yen. 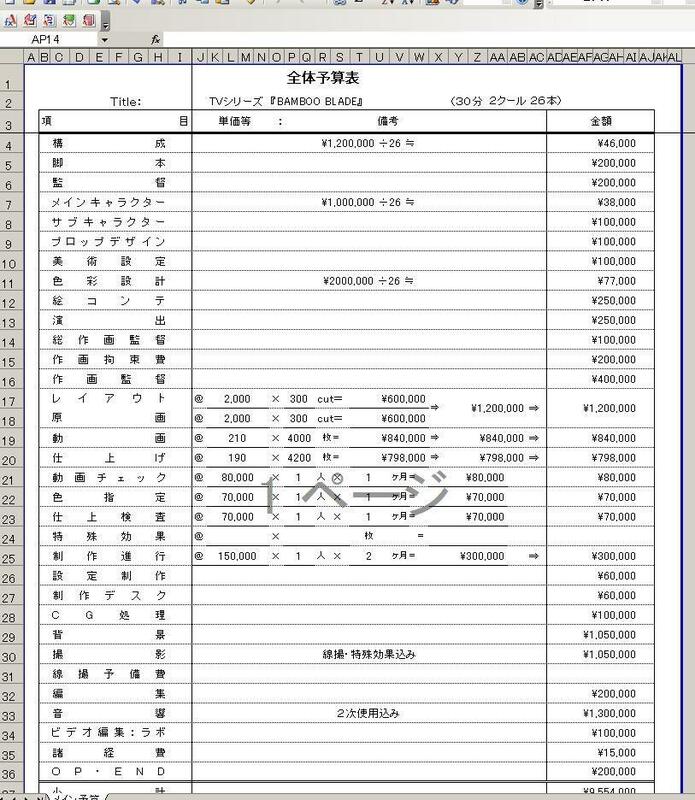 This image (in Japanese) is a breakdown of the costs of a single episode of the series Bamboo Blade. As you can see, the price comes in at just under 10 million yen. This site has some more info, as does this list (though not everything there is anime and most is old). But the bottom line is that the market price is roughly 10 million yen per episode, which comes out to 230 yen per frame. Some of that goes to things other than animation, but the bulk is for art and animation costs. As for the source, the production company typically self-funds its own original anime. For example, Puella Magi Madoka Magica was funded by Aniplex. For adaptations, the publishing company typically provides some or all of the funding, as it serves as a form of advertising for the original. The details on these arrangements are very secret and can vary a lot. Note that the production company also has to pay for the TV run in most cases, since late-night TV slots are purchased by production companies as a form of advertising for their final product e.g. DVDs (see Why does anime usually air at night in Japan? for more information on this). According to this blog post, for a 52-episode series airing on 5-7 stations, this would be in the ballpark of 50 million yen, or about 1 million yen per episode. They typically only make back their money at the point of DVD sales, which is why studios never know exactly how much money they're able to invest on a new series. Not the answer you're looking for? Browse other questions tagged anime-production or ask your own question. Why does anime usually air at night in Japan? Why not export to America? Are anime budget and worldwide gross data publicly available? Does making a TV anime series cost less than making a typical TV series? Why is anime so expensive to make? When do animes get subsequent seasons? Why don't anime shows finish the manga? Why is dubbed anime commercially considered a “premium”? Why do anime discs cost so much in Japan compared to other countries? What started the trend of 3-5 minute long episodes for anime series? What are OVAs and how are they different from Specials? By number of series, how much of the animation industry is made up by anime? What is the process of acquiring a streaming license? Are one-off openings and endings expensive to produce?